From multiple sources I am picking up considerable concern regarding the broad implications -- diplomatic and security -- with regard to any relinquishment by Israel of full control of the Jordan Valley. Apologies that this map says "West Bank" and not, properly, Judea and Samaria. It is the best I could find in order to clearly illustrate the location of the Jordan Valley -- the lowland that abuts the bank of the Jordan River. I wrote the other day about the expectation ("demand") voiced by Kerry that Israel remove all Jewish communities in the Valley. There might be some IDF forces stationed for a period of time in the Valley, but they would subsequently be replaced by international (US?) forces. An unmitigated disaster. 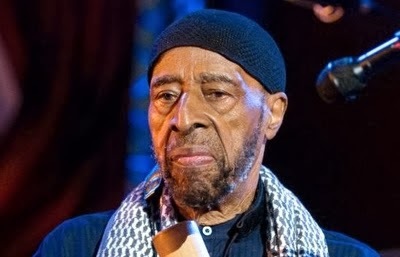 The passing of Al-Hajj Dr. Yusef Abdul Lateef, 93, on Dec. 23 in Massachusetts brings to mind the exotic, semi-forgotten influence of Islam on the American music scene in the 1950s, when Islam, and specifically Ahmadiyya Islam, was cool. Lateef was born William Emanuel Huddleston on Oct. 9, 1920, in Chattanooga and grew up in Detroit, where his father changed the family name to Evans. He began as a saxophonist in 1946, then went on to play the flute, oboe, bassoon, and many other instruments. In a very long and important career, he made music with such renowned figures as Cannonball Adderley, Donald Byrd, Dizzy Gillespie, and Charles Mingus, as well as being a band leader in his own right. Yusef Abdul Lateef died at 93 on Dec. 23, 2013. Let me qualify this: The only viable game. I'm speaking of the Levy Report Campaign. I'm not promoting this because I'm working on it. Quite the contrary, I am working on it because I believe it merits enormous promotion. Why do I call it the only viable game? Because I see it as the best option for advancing Israel's rights. It's the hook that provides rationale for Israel's legal grounds, and offers a basis for moving ahead so that the paradigm of thinking can be changed. No more "occupation." And so I will continue to talk about this, especially during these terrible times. As we progress I will ask that you inform yourselves about the Report, share information with others, and otherwise assist us. For today, a reminder: The Levy Report on Facebook. Like it, share it, promote it. And a small word of caution: Facebook has a page called "About Levy Report" that has nothing to do with us. Be careful when accessing the page. And now, a look at these terrible times. Israel is not an apartheid Nazi state. Islam is the largest practitioner of both gender and religious apartheid. Infidel violence against or hatred of Muslims is a mere drop in the bucket. Muslim-on-Muslim violence is a pandemic and indigenous feature of Muslim-Muslim relationships, beginning with the endless religious feuds between Sunni and Shiia Muslims. Today, Muslims are torturing, exiling, and blowing each other up in Egypt, Syria, Somalia, Sudan, Pakistan, and Afghanistan—to name only a few Muslim-majority countries. While the West may be imperfect, mea culpa, mea culpa, Islam has a very long and bloody history of imperialism, colonialism, anti-Black racism, conversion via the sword, slavery, and the above mentioned apartheid. The Hill reported mid-Sunday that leading Senate Democrats are doubling down on a bipartisan push to impose sanctions on Iran should the Islamic republic either cheat on the terms of the Joint Plan of Action during an upcoming six-month negotiating period or, at the end of that period, refuse to verifiably put its nuclear program beyond use for weaponization. Jerusalem - A number of non-governmental organizations (NGOs) claiming a moral human rights agenda are exploiting the holiday season and religious messages to advance prejudicial anti-Israel campaigns including in some cases blatant antisemitism, reports Jerusalem based research institute NGO Monitor. As in previous years, groups such as Christian Aid (UK), Kairos Palestine, Sabeel, War on Want (UK), Amos Trust, and Adalah-NY abuse holiday and religious symbols, using offensive and inflammatory rhetoric in Christmas carols, holiday messages and cards, and nativity scenes. Some use their holiday appeals to encourage boycott, divestment, and sanctions (BDS) campaigns, adding fuel to recent discriminatory boycotts against academic institutions in Israel. Does The US Have The Guts To Call Iran's "Poorly Played Bluff"? Iran successfully avoided the terms of the last agreement with the West designed to limit its nuclear program -- and has boasted openly this time around that it has retained the right to enrich its Uranium and continue its program virtually unimpeded. But this times things are different. It's just that the Obama administration appears reluctant to take advantage of that fact. In April 2013, I published an article with the slightly inaccurate title, "Support Assad." Better would have been "Support Whichever Side Is Losing in the Syrian Civil War." Back then, it seemed that the regime of Bashar al-Assad was doomed; but already a month later, that was no longer the case and eight months on, a consensus has emerged that Assad is slowly winning. Eugene Kontorovich, professor of international law. Remote communities totally snowed in. Roads blocked by trees that came down (because the snow is very heavy). Black ice. Power outages. Babies delivered in cars that didn't reach the hospital in time. Schools closed in some areas. Meetings cancelled. We're on the way back to normal. But the progress has been slow because this is such an unusual phenomenon here. People don't own snow shovels (I wouldn't know where to buy one!) and so many sidewalks remain covered in half-melted snow that is still freezing at night. 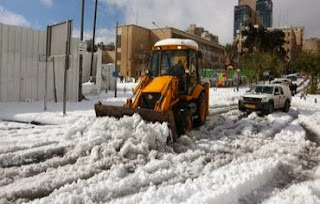 What is more, there is insufficient municipal equipment for the clearing of every side street. This is a function, in part, of the rarity with which the equipment would be used, and, as well, a function of the diverse and more pressing demands made on a limited budget. But if the equipment for good snow clearing is not the norm in this area, politicizing the situation sure is. Here's a chance to blame Netanyahu for not being more prepared, in light of the forecast. Could the government have been better prepared? I'm not going to go there. Perhaps. But I also know that the damages caused by a natural event cannot all be anticipated or prevented, and it's foolish to pretend otherwise. And what do you say about those people (few in number) who were foolish enough to have ventured out - towards Jerusalem, which is uphill - in the height of the storm the other day, with children in the car? The IDF had to rescue them. And rescue them, they did. Even as we dig out, the world does go on - although, I confess, much of what's happening rather makes news of the snow appealing. Jewish settlements in Judea and Samaria, the misnamed occupied territories, are not the obstacle to peace between Israelis and Palestinians. They are the acid test of peace. To argue that peace is conceivable unless the bulk of the settlements remain in place constitutes stupidity or hypocrisy. Leave aside the issue of whether Jews have the right to live in the historic homeland of the Jewish people. Ignore the fact that the settlers live overwhelmingly on what was waste land and turned into gardens, vineyards, and industries which have uplifted the lives of Palestinian Arabs more than all the aid that has passed through (or rather stuck to) the fingers of the kleptocrats of the PA. Leave aside also Israel's requirement for defensible borders: that is a critical issue but not identical to the continued presence of settlements. Accepting the settlements is the sine qua non of any viable peace agreement. It does Israel no good to defend Israel's right to exist but to condemn the settlers, as does Alan Dershowitz, not to mention the leaders of liberal Jewish denominations. The media reported that Mahmoud Abbas, head of the Palestinian Authority (PA), rejected the peace proposals submitted by US Secretary of State John Kerry. The Palestinians leaked that Abbas sent a letter to Kerry reiterating his complete opposition to the demand to recognize Israel as a Jewish state. This was declared a "red line" that the Palestinians will not cross. This "red line" is not just about semantics, but rather the essence of the conflict. The Palestinian position amounts to denying the Jews the right to establish their state in their homeland. It also indicates without any doubt that the Palestinians, despite the conventional wisdom, are not ready to reach a historic compromise with Zionism, the Jewish national revival movement. Therefore, a stable peace based on mutual recognition and ending all demands is not in the cards. The weak PA seems to accept partition of Mandatory Palestine into two states – perhaps in accordance with the PLO's stages approach – but it still refrains from accepting the legitimacy of the Zionist enterprise. 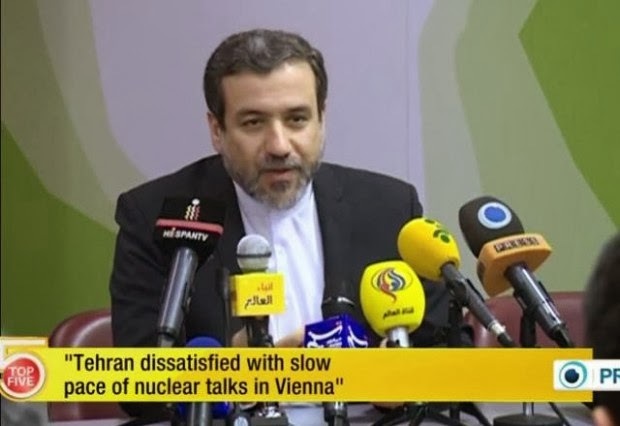 Iran’s deputy nuclear negotiator Abbas Araqchi. I wrote that the previous agreement between the West and Iran should be used as a model for predicting how the ongoing P5 + 1 negotiations will go. In the coming months when Iran and the West have a dispute over the meaning of terms of the Geneva deal or the discovery of something suspicious in Iran, Iran knows that it can bluff its way out of suffering any consequences for its bad faith. Last week the Treasury Department designated a number of companies and individuals for their illegal trade with Iran. The Iranian reaction was predictable. Last month, Jewish Press reported US Academic Group May Boycott Israeli Universities. At issue is the American Studies Association (ASA), which at its annual meeting in Washington, D.C. entertained a resolution to boycott Israeli academic institutions. Palestinian universities and schools have been periodically forced to close as a result of actions related to the Occupations, or have been destroyed by Israeli military strikes and Palestinian students and scholars face restrictions on movement and travel that limit their ability to attend and work at universities, travel to conferences and to study abroad, and thereby obstruct their right to education. The petition goes on a bit in that vein, and includes the fact that foreign academics face interference when trying to reach “Palestinian” academic institutions. As Lori Lowenthal Marcus, the irony -- or ignorance -- displayed by the ASA is that none of the 19 degree-granting institutions serving the Arab Muslim population of the "West Bank" or Gaza existed before 1967. 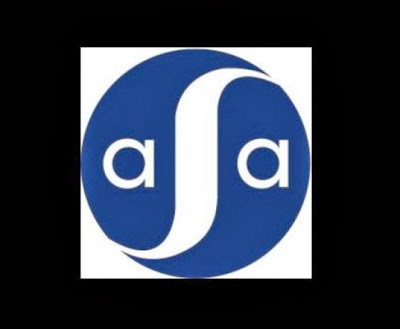 But beyond the challenge of logic, the American Studies Association will be facing legal challenges as well. 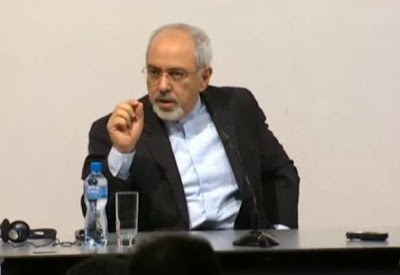 Many questions have arisen about whether the P5+1 (U.S., Russia, China, Britain, France and Germany) and the Islamic Republic of Iran interpret the interim understanding reached in Geneva on November 24, 2013, in the same way. Indeed, at times it appears that they are not talking about the same piece of paper. at least there was no confusion about where to sit. 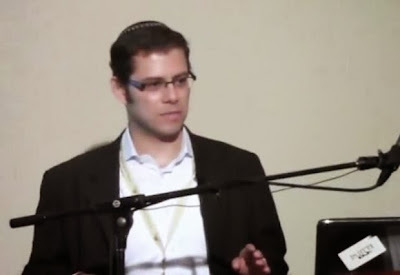 Here is Eugene Kontorovich's first public lecture since making Aliyah, exposing the hoax behind the threat of a one state solution. Eugene Kontorovich is a professor of international law at Northwestern University School of Law and a visiting professor at the Hebrew University. Before we get to Obama, who makes me (as most of you) terribly tired, I would like to address other topics. The core question here is whether Bedouin families will be permitted to remain on land that they have usurped illegally. Will they be allowed to continue to function as squatters, or must they be required to resettle in towns - complete with full services, please understand - provided for them by the Israeli government according to a plan advanced by Benny Begin, who was a (Likud) Minister in the government at the time the law was drafted. What a field day people have had - painting Israel as villainous, heartless in her treatment of Bedouin citizens of Israel. All the buzz words, such as "apartheid" and "displacement" are invoked. The fact that the truth lies elsewhere is frequently ignored. Anti-Israel bias at The New York Times increased in late 2013, with news reporters shunning impartiality and, by expressing hostile opinions, making the supposedly objective news pages increasingly resemble the newspaper's opinion pages. 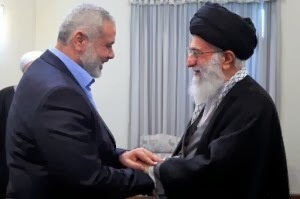 When Did The Quaker AFSC Become So Friendly With Ahmadinejad and Palestinian Terrorists? When Did the Quakers Stop Being Friends? In the summer of 2013 an unusual gathering of students took place in an undisclosed location in upstate New York. Sponsored by the American Friends Service Committee (AFSC) along with Jewish Voice for Peace, the "We Divest Campaign Student Leadership Team Summer Training Institute" offered a five-day program to trains campus activists and organizers in the "Boycott, Divestment and Sanctions" (BDS) movement, a loose coalition of anti-Israel groups seeking to cripple the Israeli economy. Promising "fun in a summer-camp like environment" for only a $100 registration fee—the rest is subsidized by the sponsors—AFSC's program included "extensive campaign development coaching," "grassroots organizing skill building," "media and messaging trainings," "anti-oppression analysis workshops," "relationship building with activists on campuses nationwide," "strategy sessions with BDS movement leaders," and more. Participants represented some of America's best-known elite universities, including the University of Pennsylvania, Brown, Brandeis, Loyola, Oberlin and Georgetown. The murder trial of British soldier Lee Rigby, 25, the father of one, a member of the Corps of Drums with the 2nd Battalion, the Royal Regiment of Fusilier and a veteran of the Afghan War, is underway in London. Michael Adebolajo, 28, and Michael Adebowale, 22, are on trial charged with murdering Rigby as he walked back to Woolwich Barracks in southeast London on May 22, 2013. Adebolajo and Adebowale, both British citizens, drove a car straight at Rigby in broad daylight as he walked across the road, hitting him from behind and then repeatedly stabbing him with a meat cleaver and knives in front of a crowd of bystanders. Fusilier Rigby died of multiple stab wounds. Instead of fleeing the scene, Adebolajo gave interviews to the crowd while holding the murder weapon in his bloody hands. He wanted to make it clear that the Islamic motivation for the attack was known, he said: "We swear by the almighty Allah we will never stop fighting you until you leave us alone. We must fight them as they fight us. An eye for an eye, a tooth for a tooth." Adebolajo also handed a letter to one of the witnesses that read, 'To my beloved children know that to fight Allah's enemies is an obligation. …'Seek Shaheedala oh my sons so that you might be raised together." There is no dispute that the motivation for the murder was vengeance against the enemies of Islam. The two men were successfully radicalized and incited to murder by jihadist propaganda that continually asserts that their honor has been disrespected, that Muslim territory has been occupied, that Muslim holy lands must be purified of infidels and that cleansing Islam of infidel unbelievers is a function of jihad, holy war and a justification for murder. Mideast Media Sampler 12/6/13: Why Does Kerry Handle Palestinians as Gingerly as Iran? A few months ago, Secretary of State John Kerry allowed as to how he was worried about Israel’s future if it did not reach a peace deal with the Palestinians. Israel’s Prime Minister has played along sending his emissaries to negotiate with Palestinian partners who don’t want to make a deal. Nearly two million Shiite pilgrims passed from Iran to Iraq between March 2009 and February 2010 through the Mehran land border crossing. Thousands more entered Iraq through other land border crossings or by air travel. These pilgrims came from countries the world over to visit the tombs of the Shiite imams in Najaf, Karbala, and Baghdad. By way of comparison, 1.6 million Muslims traveled to Saudi Arabia for the 2009 hajj (an additional 700,000 Muslims from within Saudi Arabia also participated) while some 700,000 religious pilgrims visited Christian and Jewish holy sites in Israel in the same year. Clearly, the pilgrimage to Iraq is a major religious phenomenon. 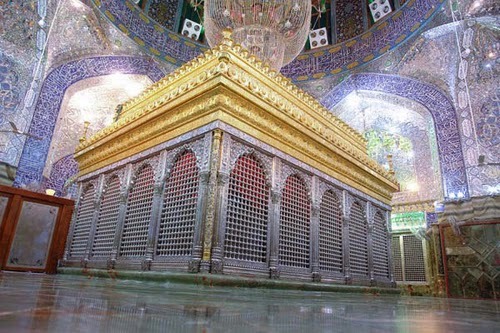 The tomb of Imam Ali in Najaf, Iraq, is one of the holiest shrines for Shiite pilgrims. Millions of Iranians flock to it and other sites across the border annually, and control over what the pilgrims see and hear has become a major issue for the ruling theocrats in Tehran. Iranians are the largest group of foreign pilgrims to Iraq, and the Iranian government has shown great interest in promoting the trip. American journalists and policy analysts frequently describe the pilgrimage as a tool of political and economic influence, but Iran's policy seems to be dictated more by domestic concerns than by regional ambitions. Pilgrimage to Iraq is an important religious rite for Iranian Shiites, and the government prizes the prestige attending its sponsorship. The post-2003 revival of the pilgrimage has also contributed to the growing clout of Iraqi-based Shiite religious leaders, first and foremost Grand Ayatollah Ali Sistani, whose political independence and growing popularity among Iranian Shiites present a serious challenge to the legitimacy of Iran's state-sponsored religious establishment. The Iranian authorities are aware of this threat, but their efforts to counter it have so far been hampered by political and religious sensitivities. In the years to come, the political impact of the pilgrimage to Iraq may do much to shape the future of both countries as well as that of the Shiite world. 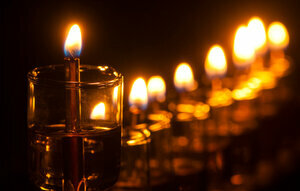 I give thanks for this Chanukah season, which is buoying me - and I hope many of you! - during a difficult time. In an untypically abrasive speech, Saudi King Abdullah welcomed the ouster of Egypt's president Muhammad Morsi, stating: "Let the entire world know that the people and government of the Saudi kingdom stood and still stand today with our brothers in Egypt against terrorism, extremism, and sedition." However dramatic, this apparent shift from Riyadh's traditional accommodation of perceived enemies, such as the Muslim Brotherhood and its regional affiliates, to a more daring foreign policy is too little too late to reverse the decline of its regional power. And nowhere was this weakness more starkly demonstrated than in Riyadh's botched Syrian intervention, led by its most celebrated diplomat—Prince Bandar bin Sultan. The "Joint Plan of Action" signed with Iran by the so-called P5+1 (China, France, Germany, Russia, the U.K., and the U.S.) on Nov. 24 in Geneva caused Shiite Arabs to celebrate, Sunni Arabs to worry, and Saudis to panic. The Saudi response will have far-reaching and unpredictable consequences. 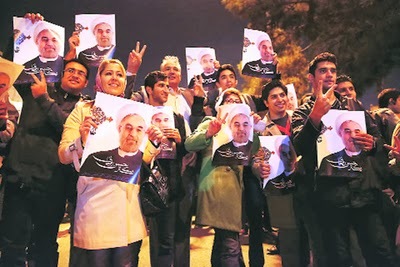 Jubilant crowds welcomed the Iranian negotiator home from Geneva. As Iran's chief negotiator, Mohammad Javad Zarif, brought home a deal worth about US$23 billion to Iran,Arab Shiites fell into step with Tehran. Prime Minister Nouri al-Maliki of Iraq expressed his "full support for this step." President Bashar al-Assad of Syria welcomed the agreement as "the best path for securing peace and stability." Parliamentary Speaker Nabih Berri of Lebanon called it the "deal of the century." And Hezbollah considered the agreement a "great victory for Iran." In February 1997, Hamas carried out a double suicide bombing on the Ben Yehuda pedestrian mall in downtown Jerusalem, resulting in 5 deaths and many injured. In 2001, attornies Nitsana Darshan-Leitner and David Strachman brought a suit against the Iranian government on behalf of 5 American families of those injured in the Hamas terror attack, based on the material support and resources Iran supplied to the terrorists. In 2003, a DC court awarded the families more than $70 million in damages. Jonathan Spyer: Is the US Changing Sides in the Regional Conflict Between Iran and Its Enemies? A report by respected Washington-based journalist Hussein Abdul Hussein in the Kuwaiti Al-Rai newspaper this week revealed details of an indirect US channel with Hezbollah. The report comes, of course, close on the heels of the interim agreement concluded in Geneva between the P5 + 1 world powers and Iran, allowing the latter to continue to enrich uranium. News items are also surfacing suggesting a stark split between the US and Saudi Arabia over regional policy in general, and policy toward Syria in particular. Saudi officials are going on the record expressing their alarm at the direction of American policy. Happily stirring the pot, some Iran-associated outlets have suggested that Washington is actively seeking to rein in Saudi intelligence chief Prince Bandar bin Sultan, who favors a hardline against Iranian interference in the region. Meanwhile, agreement has now been reached over the long-postponed "Geneva 2" conference, to discuss the war in Syria. The conference will go ahead because US-backed Syrian opposition representatives abandoned their demand that President Bashar Assad could have no part in any transitional phase of government in the country. What does all this add up to? There are an increasing number of voices which perceive a shape behind all these details: Namely, an effort by the current US administration to turn the Iranian regime from an adversary into a partner. The method: Acceding, in part or whole, to key Iranian demands. Let's take a look at each item in more detail. As the full ramification of the Muslim Brotherhood's year in power continues to be exposed, a new study by Al Azhar's Fatwa Committee dedicated to exploring the fatwas, or Islamic decrees, issued by the Brotherhood and Salafis -- the Islamists -- was recently published. Al Azhar, in Cairo, is considered by many to be one of the oldest and most prestigious Islamic universities in the world. 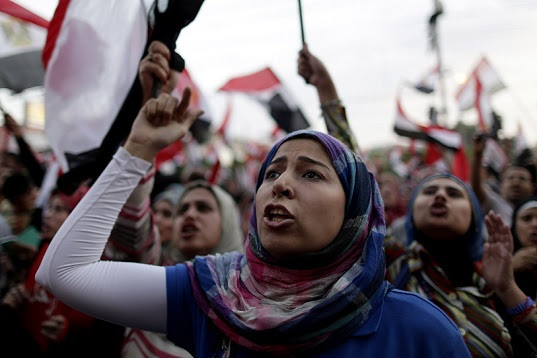 The study, written by Al Azhar's Dr. Sayed Zayed, and entitled (in translation), "The Misguided Fatwas of the Muslim Brotherhood and Salafis," reveals a great deal about how Islamists view women. 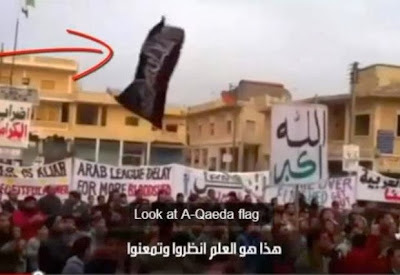 The Egyptian newspaper Al Masry Al Youm summarized some of the Al Azhar study's main findings and assertions on November 15 in a article entitled (in translation), "Muslim Brotherhood fatwas: A woman swimming is an 'adulteress' and touching bananas is 'forbidden.'" Two decades after the signing of the declaration of principles (DOP) by Israel and the Palestine Liberation Organization (PLO) on the White House lawn, there is something unreasonable in the world's continued adherence to the Oslo paradigm, tattered and battered as it is by years of a bloody fiasco. The Palestinian Arab leadership has consistently and adamantly rejected the two-state solution since its first articulation in 1937 by the British Peel commission and has, as consistently, advocated the destruction of the Jewish state. Still, it undertook a successful public relations campaign in the 1980s promoting the notion of a Palestinian state in the West Bank and the Gaza Strip—"the occupied territories." 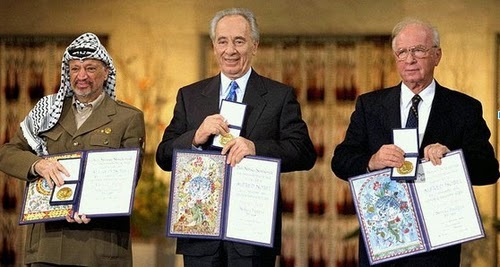 Twenty years of Oslo, filled with optimism and enthusiasm and adorned with Nobel prizes, like the ones held here by Arafat, Peres and Rabin (l-r) have delivered no peace for either side of the Palestinian-Israeli conflict. Firmly entrenched in its place, however, is a textbook example of cognitive dissonance written on a grand political scale, as the failed Oslo paradigm is revived again and again. Over the years and especially in the wake of the DOP, the Palestinian demand for statehood has gained rapid political momentum and international acceptance. A succession of Israeli prime ministers—from Shimon Peres, to Ehud Barak, Ariel Sharon, Ehud Olmert, and Binyamin Netanyahu—embraced the idea, as did U.S. presidents Bill Clinton, George W. Bush, and Barack Obama. The paradigm for a final peace includes among its primary components Israeli territorial withdrawal and Palestinian sovereignty, political separation with reconciliation, compromise, and coexistence. Yet twenty years on, the two parties find themselves further apart despite years of diplomatic wrangling. It is thus past time to examine and invalidate the paradigm that has taken hold in the hope that a new and less sanguinary one will take root. That Barack Obama has betrayed Israel, the Sunni Arab nations, and his own people is, to my thinking, beyond question. He has capitulated to a dangerous terrorist state. The media are full of comments and analyses about what he has done, why he has done it, and what comes next. I will attempt to summarize what is important here, and you will find links to key articles below. But to share all of the various analyses and viewpoints at length would require a book rather than a posting. I do not pretend, not for a second, that I am sanguine about any of what is going on. This is an infuriating, and exceedingly agitating business. Many commentators, most eloquently Bret Stephens at the Wall Street Journal, draw a parallel between the appeasement of Hitler at Munich in 1938 and the appeasement of Iran at Geneva. There is another, more chilling parallel: Iran's motive for proposing to annihilate the Jewish State is the same as Hitler's, and the world's indifference to the prospect of another Holocaust is no different today than it was in 1938. It is the dead's envy for the living. Dying civilizations are the most dangerous, and Iran is dying. Its total fertility rate probably stands at just 1.6 children per female, the same level as Western Europe, a catastrophic decline from 7 children per female in the early 1980s. Iran's present youth bulge will turn into an elderly dependent problem worse than Europe's in the next generation and the country will collapse. That is why war is likely, if not entirely inevitable. In Saturday night’s P5 + 1 deal with Iran, Iran agreed to submit an “additional protocol” of more intrusive IAEA inspections of its nuclear program. For the first time in nearly a decade, we have halted the progress of the Iranian nuclear program, and key parts of the program will be rolled back. Iran has committed to halting certain levels of enrichment and neutralizing part of its stockpiles. Diplomats and journalists cite the 2003 agreement as a precedent for current negotiations with Iran. For one thing it was the first nuclear agreement between Iran and the West. Furthermore, Iran’s lead negotiator then was Hassan Rouhani, now Iran’s president. While that may have been the first nuclear deal reached with Iran; the lessons from it may not be ones that the cheerleaders for the P5 + 1 deal have in mind. As non-Muslims come to understand the Islamist challenge, anti-Islamic sentiments in the West are increasing, probably at a faster rate than Islamic practices. As anti-Islam trumps Islam, (I have concluded) opinions "will grow yet more hostile to Islamism over time. In this way, Islamist aggression assures that anti-Islamism in the West is winning its race with Islamism." Danielle Pletka, vice president for foreign and defense policy studies at the American Enterprise Institute (AEI), was on a conference call this afternoon, sponsored by The Israel Project. She discussed the 6 month deal just agreed to with Iran in Geneva -- what the agreement contains and what it actually means. One of the worst Christian massacres—complete with mass graves, tortured-to-death women and children, and destroyed churches—recently took place in Syria, at the hands of the U.S.-supported jihadi "rebels"; and the U.S. government and its "mainstream media" mouthpiece are, as usual, silent (that is, when not actively trying to minimize matters). The massacre took place in Sadad, an ancient Syriac Orthodox Christian habitation, so old as to bementioned in the Old Testament. Most of the region's inhabitants are poor, as Sadad is situated in the remote desert between Homs and Damascus (desert regions, till now, apparently the only places Syria's Christians could feel secure; 600 Christian families had earlier fled there for sanctuary from the jihad, only to be followed by it). As the Syrian civil war grinds on toward its fourth year, no end appears in sight. It is the greatest disaster in the Levant in a generation: More than 115,000 people have died. Around 2 million refugees have departed the country—for Jordan, Lebanon, Turkey, and beyond—while untold more who have left their homes remain in Syria, seeking with increasing desperation to put themselves and their families out of reach of the guns. But while the war appears far from ending, its direction and likely outcome have shifted significantly in the past year. The past decade has seen a dramatic improvement in Turkish-Iranian economic relations, culminating in a 2007 memorandum of understanding on the transfer of Iranian and Turkmen natural gas to Europe via Turkey, and the 2009 treaty for cooperation in air, land, and sea transportation. This led to the rapid expansion of bilateral trade by 30 percent with the number of Iranians visiting Turkey growing by 118 percent and the number of Iranian vehicles entering Turkey rising by 66 percent. And while bilateral relations have somewhat soured as a result of the Syrian civil war, with Tehran backing the Assad regime and Ankara supporting the rebels, economic interaction has remained largely intact. The growing border porosity and unchecked movement of people has, however, kindled fears of serious security challenges, including an escalation in terrorism and transnational crime. Pointing to Iran's role as both a major production center of methamphetamine and a transit route for Afghan opiates, security experts have argued that economic integration and free movement could spur drug trafficking and increase collaboration between transnational organized crime syndicates. How well-founded are these concerns? Has the Turkish-Iranian economic integration led to a significant increase in drug trafficking across the joint border? And how did the nature of drug trafficking and interdictions of drug enforcement agencies change over the course of the transition process? The failure of the Bush and the Obama administrations to topple Syria's president Bashar al-Assad goes a long way to explaining Washington's declining Middle Eastern position. United by a distinct lack of vision, as opposed to hopes and wishful thinking, as well as determination and a coherent plan of action, these otherwise very different administrations helped erode America's stature in the region. Widely seen as a declining superpower that has lost belief in itself and its leading role in the world, Washington earns neither fear nor respect in the Middle East. 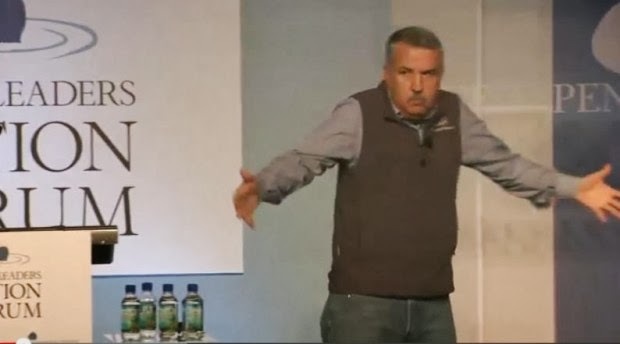 Readers should not be buying what Thomas Friedman is selling. The featured image of Thomas Friedman above comes from a talk he gave about many of the marvels of modern technology. At the beginning he says that you have “every bit of knowledge available to you” from Google. It’s a bit of an overstatement, but his point is essentially correct. One particular effective use of Google is fact checking writers like Friedman, who make unsubstantiated claims. In Friedman’s case, it happens quite a bit. He has a habit of taking great sounding ideas and turning them into columns. But that doesn’t mean that he’s right. Often he leaves out critical information. This week Friedman did this once again.